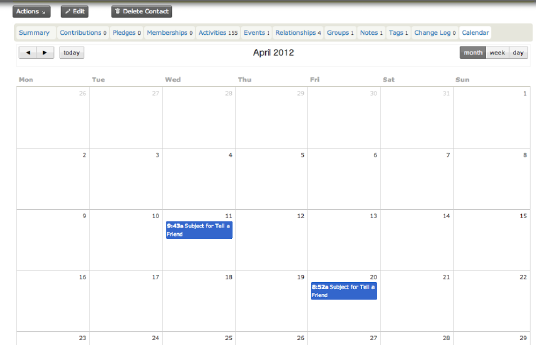 We're really pleased to release a little extension which adds a contact calendar to the contact record. The calendar shows activities where contact is assignee or a target contact in a Day / week / month view and is useful for helping to schedule future activites for your contacts. It's currently in Alpha - so please let us know if you have any issues or comments! We're hoping to add a few features to this in the future including hopefully adding it to the contact dashboard for when you log in. Wish you all well to use it! Thanks Jamie, sending good karma your way. I was really excited when you release the Alpha version of your Calendar for CiviCRM 4.2 back in March. You looked like you were off to a good start, but haven't seen any updates or activity on github. I think it could be very useful for a lot of folks. Did you plan on following through with stable development release for 4.3 anytime soon?